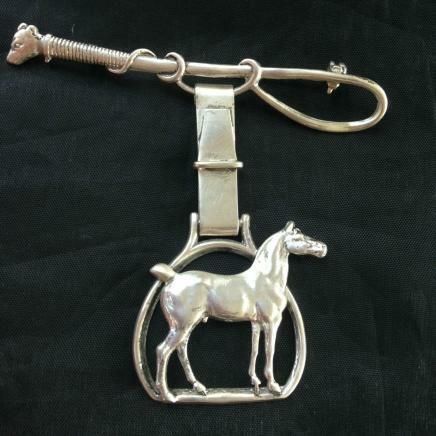 I have for sale a wonderful sterling silver brooch.The brooch is in the shape of a horse head and a riding crop. This brooch would usually be worn on the lapel of a show jacket. This lovely brooch is offered in great condition. I have for sale a wonderful sterling silver horse show pin. The pin is in the form of a bar with a horse head suspended. This would be presented by using some pins and attaching it to a hankie or the breast of a show jacket. This lovely piece is offered in great condition. The back of the horse head is hallmarked 925. I will ship worldwide please get in touch for a quote. I have for sale a wonderful sterling silver show Pin. The brooch has a solid silver frame with a beautiful enamel image of a bay horse set inside. This lovely brooch is offered in great condition. The back of the brooch is hallmarked 925. I will ship worldwide please get in touch for a quote. I have for sale a wonderful sterling silver brooch. The brooch is in the shape of a horse and foal. This lovely brooch is offered in great condition. I will ship worldwide please get in touch for a quote. I have for sale a wonderful sterling silver horse show brooch. The brooch depicts two horses wearing bridles. This lovely brooch is offered in great condition. I will ship worldwide please get in touch for a quote. For sale is a charming sterling silver horse show pin. This piece has a large horse displayed inside a horse shoe. The top part of the pin is in the shape of a lunging whip. This pin has fabulous detail. A wonderful piece to add to your collection offered in excellent condition. The back of the clip is marked ‘Sterling.’ I will ship worldwide please get in touch for a quote.